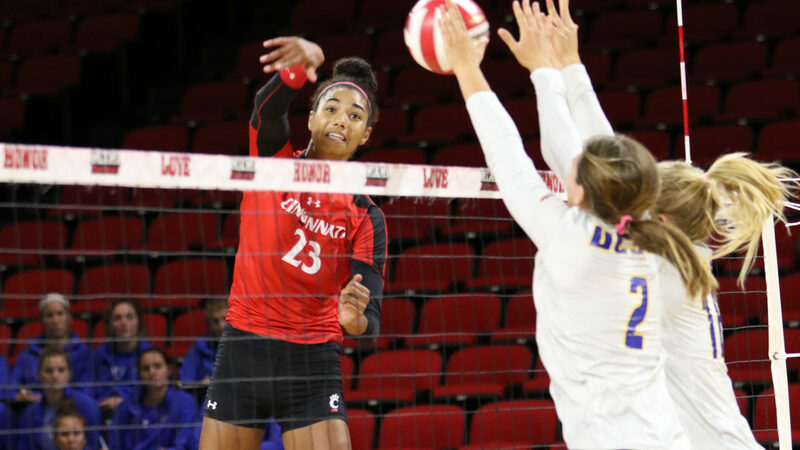 A standout all-around weekend has gained Cincinnati’s Jordan Thompson her second VolleyMob Player of the Week nod. Thompson averaged 7.89 kills, 3.00 digs and 0.56 blocks per set, while hitting .400 in wins over Tulsa and Wichita State. The redshirt junior posted 27 kills, 18 digs and three blocks while hitting .392 in the four-set win over Tulsa. The right side then notched an American Athletic Conference, school and Koch Arena record 44 kills while hitting .404 and adding nine digs, two blocks and two aces in a five-set win over Wichita State. Thompson was also named as the American Athletic Conference Player of the Week.